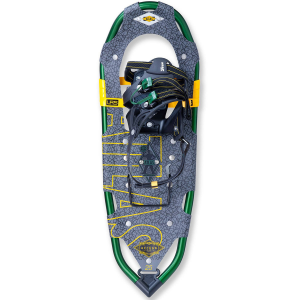 Built for climbing, but make a great all terrain snowshoe; these work well on or off trail. Great traction in most conditions including on hidden branches and other debris under the snow. 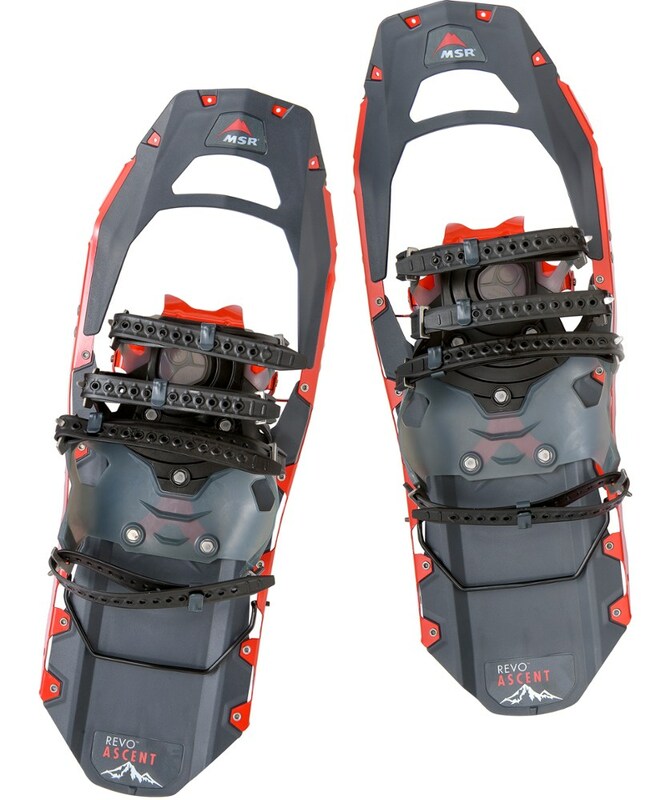 Secure multi-strap bindings adjust to different boots easily. With a toe made for kicking and easy to use heel elevator these shoes live up to their name and excel at climbing but have some issues on descents due to the lack of a heel crampon. 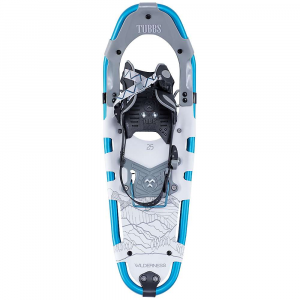 They have pretty good float and are worth considering for those hitting steep climbs or rugged terrain but are probably overkill for a groomed, flat trail walker. 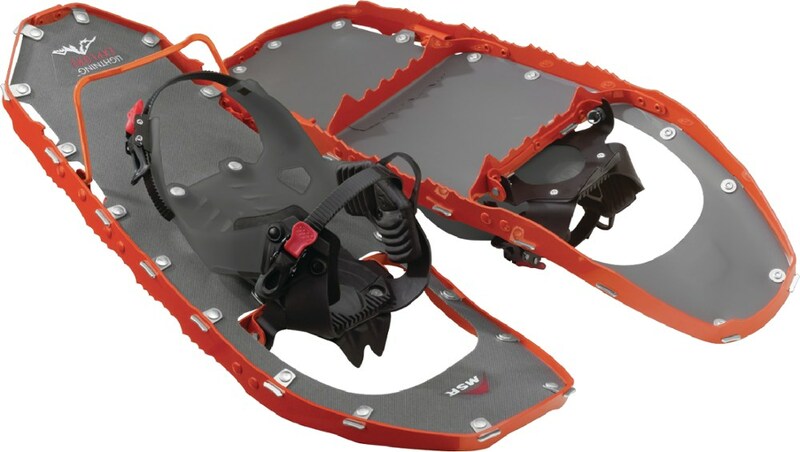 The MSR Revo Ascent snowshoes combine a sturdy steel traction platform with a light weight plastic deck to create a shoe that works pretty well in deep snow or in bushwhacking situations where objects under the snow need to be navigated. They come in two sizes; 22” and 25”. This report is based on my experience with the 25” model. There are additional 5” tail extensions available but I have not purchased them. The recommended weight range for this version is up to 220 pounds with the extensions listed by MSR as taking that up to 280 lbs. A four strap binding is used with a very simple cleat that can easily be attached or detached without taking off my mitts. The straps become stiffer in sub zero temps but remained fully functional. The straps combine with a harder, white plastic deck that wraps around the bottom of the boot to keep the foot well positioned. This deck also became very stiff in subzero temps and did not form to the boot as well but was still functional. The entire external edge of the steel traction platform is of a saw tooth design which provides good grip in hard packed or crusty trail conditions. The bite this gives the lateral edges is great for digging in for traversing a slope. It also comes in handy when you find yourself stepping on limbs and branches. I found good purchase rather than slipping off when debris was encountered. 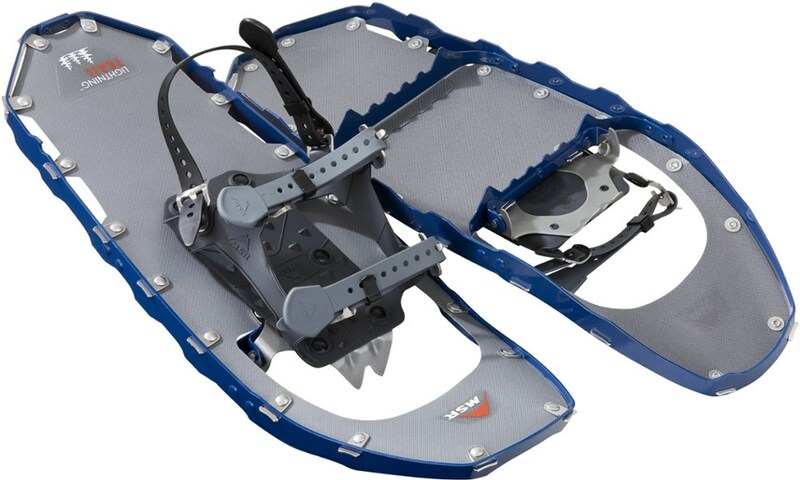 The crampon system consists of a traction bar with a two toothed independent crampon forward with no heel crampon. 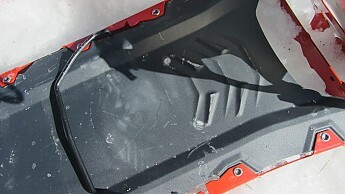 Rear deck traction consists of ribs on the under side of the plastic. Testing was conducted over several months locally here in Maine with and without pack plus a couple of overnight trips to N.H. with full winter pack. Conditions varied from several feet of fresh powder to hard crusted packed trails, ice slabs and off trail bushwhacking. I didn’t take them up any serious mountains, but was able to do a fair amount of climb testing in varying snow conditions on some steep hills. The two-piece PosiLock AT binding system consists of four straps attached to a firm plastic base that wraps around the bottom of the foot. This base keeps the shoes snugly attached to my boots while striding and is attached directly to the independent crampon. This means the natural action of lifting the shoe while climbing puts the crampon at a good angle to attach to the slope. The simple strap and cleat attachment was pretty easy to figure out and to use, but with a total of eight straps to connect it can be time consuming. I do like the multiple strap approach as it lets you spread the tension out across the whole foot allowing for less pressure to be used. Cutting off blood flow means cold feet but these binding never made me feel I needed to cinch them down and I never had any unintended detachments. I really liked the ability to seamlessly swap from a standard hiking boot to my huge, insulated Baffin Impacts. The straps don’t have a lot of holes left, but they are long enough to reach. Given the open look of the design I was surprised by the floatation this shoe had. For their compact size and shape they kept me a bit more than ankle deep in several feet of fresh powder. I go somewhere around 200 lbs and have used these shoes with 50+ lbs pack so I’ve definitely exceeded their suggested load and still found them pretty functional. At 25” they remained maneuverable in between the trees. Traction being one of the primary things to look for in a snowshoe, I was both very pleased and a bit disappointed in the Revo Ascents. The sawtooth design of the long edges of the traction platform functioned well. 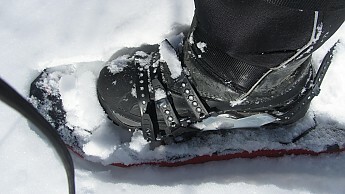 The shoes allow a bit of torsion flex so those edges are able to make good contact on uneven snow surfaces. On crusty, hard packed trails they let the entire shoe dig in rather than just the crampons so I felt confident striding normally. 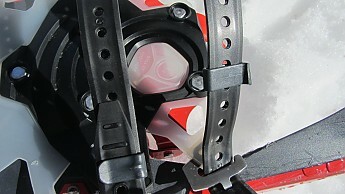 The independent front crampon also seemed well designed. In most all conditions other than hard ice slabs they dug in securely. With the heel elevator employed for climbing the independent crampon was rotated forward into a perfect position to grab when the toe was kicked in or when striding on an already broken upslope. 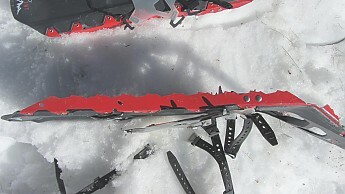 The combination of crampons, underchannels in the plastic deck and the sawtooth perimeter worked well when traversing slopes. The hard, straight, steel edges were easy to use to cut into the slope to create a flatter foundation under foot. They also grabbed onto branches or sticks rather than slipping off dangerously as shoes with a tube perimeter sometimes do. One area where I found traction lacking was when descending steep slopes. The lack of a heel crampon could be overcome up to a point by focusing on how I planted the front crampon. In somewhat deeper powder that technique had only limited success with brief periods of “skiing” being the result. These shoes also did not feel very comfortable on slabs of hard ice. I would definitely recommend swapping out to crampons especially if hard ice was encountered on a descent. The heel elevator on the Revo Ascents is quite easy to use. Unlike some versions this has only a single position which raises the heel about two inches. Once I got the hang of using a pole tip to do it I found I could raise or lower them in just a few seconds. The difference in foot position really was noticeable on steep slopes both in terms of traction and comfort. Having only one setting does limit the times it can be employed, but I didn’t find that to be an issue. Over all the shoes have proven to be pretty sturdy. There are some scrapes to the plastic on one toe deck from me stepping on it with the other shoe. This doesn’t impact function yet, but I imagine I’ll have to watch out I don’t wear that whole toe off. One of the strap retention clips seems to have broken which I reported to the Cascade Designs folks. Waiting for response at this point and will update once I hear from them. One other area of concern is some discoloration and deformation of the plastic deck. As of now it hasn’t impacted performance but I will be watching to see if it is just cosmetic or the start of a failure. 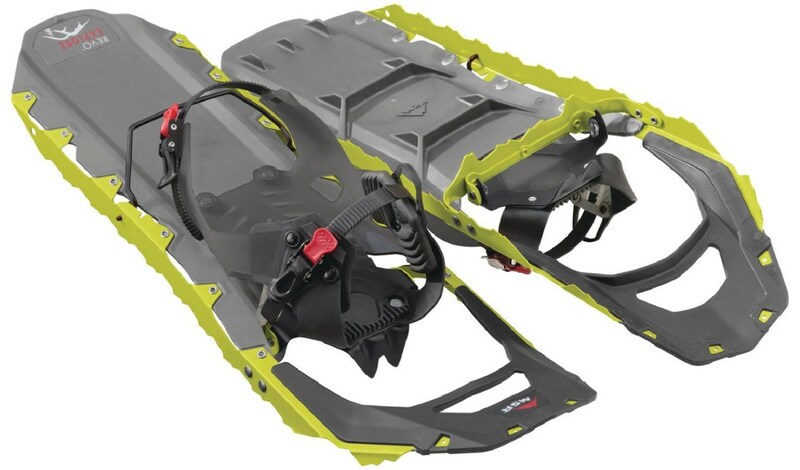 Given my experience with the MSR Revo Ascent snowshoes I would recommend them for climbing and back country use, but with a few points of hesitation. The downhill traction doesn’t seem to be a deal breaker for other folks I’ve heard talking about these shoes and I feel the same. 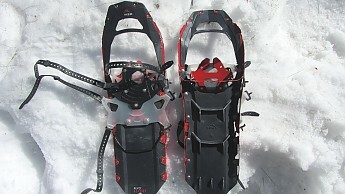 Still the lack of a heel crampon does change the traction dynamics and needs to be considered. I think that also leads to the less comfortable feeling on hard ice and perhaps the need to swap snowshoes and crampons more often as conditions change. I did find these shoes were great for my purposes in all other ways though. They provided pretty good floatation and were maneuverable in the trees. Easy to get into and out of with gloves or mitts on and relatively light given the steel components involved. While they do look pretty they are definitely more shoe than needed if you stick to groomed and flatter trails. Left side shows top view of deck and two piece binding. 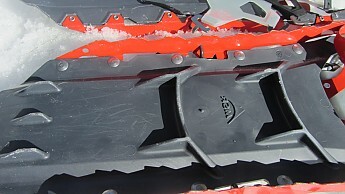 Right side shows bottom with crampon forward and traction channels on the rear plastic deck. 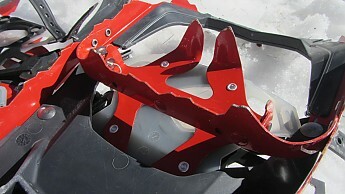 View of the sawtooth edges of the steel traction frame. 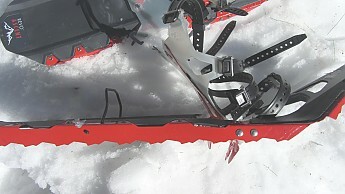 View of the traction bar and the two claw front crampon. This combination provided pretty good grip considering it is a bit minimalist. You can see from the missing paint that both parts have run into a few rocks along the way but the steel has kept its shape. Here you can see the heel elevator in the raised position. Also note how with the binding raised at the heel the independent crampon rotates which extends the teeth out. 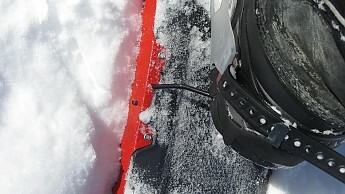 The underside of the injected plastic deck has traction bars running both across and along the surface to add some bite on all manner of slopes. It works well up until deep snow powder overwhelms it as I've mentioned. Heel resting on raised heel elevator. Binding in place on very large insulated boots. Discoloration on deck surface I am keeping an eye on. Strap retention clip that broke. I was banging into big rocks under the snow on that last trip which is when I'm guessing that happened. Not a vital component but I have reported it to Cascade Designs and will update assuming I hear back from them. Update: Cascade Designs sent out 10 replacement clips at no charge so I'm set even if I break a few more of these. I second that - great review! I've been considering a pair of Revo Explore or Revo Trail snowshoes for my everyday hiking & trail walking, and your review may have convinced me to pull the trigger for next winter. Great review, LoneStranger! Thanks for sharing it. Very similar to my MSR Lightning Ascent 'shoes, including the tail extensions. Their traction is exceptional when compared with other 'shoes. 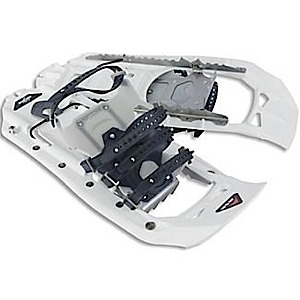 Snowshoes have their place such as when hunting when you must keep a rifle ready but backcountry skis have more flotation and are much faster. Climbing on XC skis are handled with climbing skins. In fact a person with backcountry XC skis should break the trail for snowshoers and not vice-versa. Thanks for the photos and excellent video demonstration. A very thorough review.